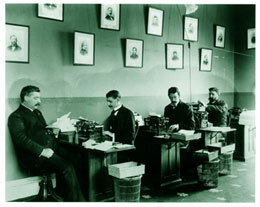 President William McKinley's staff prepares letters using manual typewriters  long before today's high-speed computers! oday, young people are taught from a very early age that it is important to make their voices heard. The very freedoms we hold dear are due, in large part, to individuals throughout history who have fought to make our nation a better place. If you and your friends feel strongly about certain issues, you should write to your local, state, and federal officials. By letting your elected leaders know how you feel, you are taking part in one of the most fundamental freedoms our nation's founders secured when they drafted the Constitution in 1787. In today's fast-paced world, communicating with the President of the United States can be as simple as typing a few sentences on a computer and clicking on a mouse. In just a matter of seconds, your message is delivered to the White House through a maze of computer circuitry and miles of cable. However, things weren't so easy when our country was young and Thomas Jefferson was President  paper was expensive, pen and ink were hard to come by, and, for some, postage was too costly. Back in the "old days," no one ever thought about "overnight express mail," "priority mail," "global priority mail," "registered mail," or "certified mail." And certainly no one ever thought about e-mail! 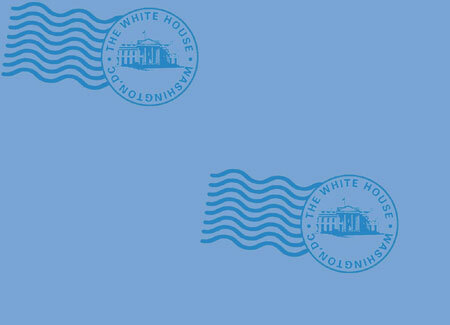 Before you sit down at your workstation, boot up your computer, log on to the White House home page, navigate through the site to find the President's e-mail address, type in a message, and send it through cyberspace, let's go back to the early 1800s and see how corresponding with our country's leader has changed over the last 200 years!